Why Learn More about Women in Agritourism? Offering recreational and educational activities on working farms, commonly called agritourism, has become a popular way to supplement agricultural income and to stimulate rural economies across the United States (Gil Arroyo et al., 2013). In North Carolina, the number of agritourism farms and the revenues from agritourism activities have grown considerably over the last decade (USDA: NASS, 2012). As agritourism increases in prominence, it is important to pay attention to the roles of women in this activity as they are instrumental to its development, maintenance, and innovation. Learning about women’s involvement in agritourism is especially needed because women tend to be less economically successful than men in this sector (Barbieri & Mshenga, 2008), mainly because they operate in a male dominated industry (McGehee & Kim, 2004). Given the increasing number of women involved in agriculture, their pivotal role in agritourism, and their lower economic success than men, it is critical to assess the entrepreneurial reality from women’s perspectives. In response, we conducted a study in 2015 to document how women in North Carolina envision their agritourism success, the challenges they face, and the opportunities they see to further develop their enterprises. We interviewed 20 women whose agritourism operations are located across three North Carolina regions (Figure 1). The participants were identified by key private and public stakeholders across the state1. 1 We collected data using a mix of qualitative methods, mainly interviews and focus groups. We audio-recorded the conversations (totaling 650 minutes), transcribed them verbatim, and analyzed the data through thematic coding. To protect the confidentiality of participants, we used aliases in lieu of real names and removed details that can identify them. We inserted (…) to indicate unnecessary text removed from quotes. Figure 1. Farm locations of study participants. Study participants were in their mid-twenties to early seventies; most had children whose age ranged from toddlers to adults. Five participants held off-farm jobs in addition to their farming responsibilities. Eleven women turned to farming in retirement or after being laid-off from previous jobs. Two participants were African-American and the remaining were non-Hispanic white. Participating women were involved in a wide breadth of agricultural production and agritourism activities. Most had animals (poultry, small and large livestock), small-scale gardens (herbs, flowers, vegetables), or value-added products (preserves, ciders). A few had row crops, specialty crops, fruit orchards, and produced honey. The most common agritourism offerings were tours, school field trips, and picnic facilities. Some offered pick-your-own and other farm-based recreation, such as corn mazes and hay rides, accommodation facilities (e.g., guesthouses, camp sites), and venues for events. How do Women in Agritourism Understand Success? 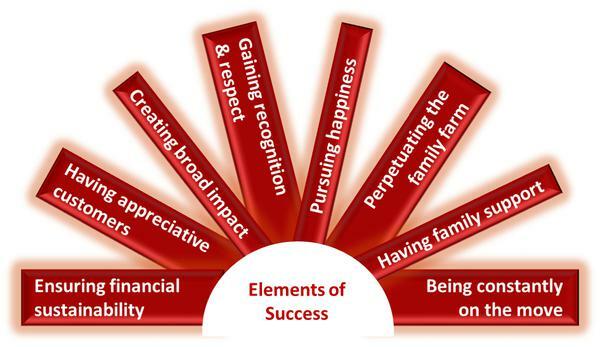 Participating women viewed success as being composed of eight aspects: ensuring financial sustainability, having appreciative customers, creating broad impact, gaining recognition and respect, pursuing happiness, perpetuating the family farm, having family support, and being constantly on the move (Figure 2). These aspects were present across women’s life-cycle stages. However, farmers in their twenties and thirties did not discuss perpetuating the family farm as an aspect of success. This may be due to the fact they are in the early stages of their family and entrepreneurial paths. Ensuring financial sustainability, unsurprisingly, was a crucial aspect of women’s success because their farms and enterprises were their main sources of livelihood. Participants also cited having appreciative customers as an aspect of success because it builds long-term relationships and ensures customers’ satisfaction. Creating a broad impact in society, especially by supporting local businesses and inspiring future generations, was also a central aspect of participants’ success. The participants’ passion for their farming livelihoods drove them to become experts in their fields. As such, gaining recognition and respect for the quality of their products and services was an important aspect of their success. Also in tune with agriculture, women viewed pursuing happiness through farming and perpetuating the farm, in terms of farmland and practice, as other important aspects of their success. Regardless of its direct (such as helping with farm chores) or indirect (such as emotional encouragement) nature, having family support was also important to their success. Irrespective of age, women mentioned that agritourism gave them the opportunity of being constantly on the move, an agritourism aspect that added to their understanding of success. This aspect was especially important to older farmers who wanted to stay active. For some participants, this also meant the constant effort to innovate farm offerings to ensure quality while their businesses were growing. Participants rejected the popular belief that work-life balance was an element of success as many doubted whether attaining such balance as a farmer was feasible. However, some acknowledged using strategies to reduce their farm workload or to lower their household expectations as a way to pursue some work life balance. Figure 2. Women’s understanding of success. What Challenges do Women in Agritourism Face? Participants identified nine challenges that women in agritourism often encounter. We summarize them below from the most to the least prevalent. Two challenges, managing business growth and struggling to perpetuate the family farm, did not appear among younger women, not even among those who came from multigenerational farms. 1. Lacking reliable staff → Mainly due to the seasonality of farming and agritourism. 2. Managing business growth → While maintaining quality and managing increased liability. 3. Lacking institutional support → To grow agritourism and educate the public about farming. 4. Struggling to perpetuate the farm → Due to disinterest in farming among the next generation. 5. Keeping up with multi-tasking → Related to farming, agritourism, and off-farm jobs. 6. Farming within gender norms → While meeting family and visitors’ expectations in a male-dominated industry. 7. Not perceived as “real” farmers → Because agritourism is not viewed as agriculture. 8. Facing endless challenges → Because many unexpected obstacles constraining agritourism adds to the uncertainty of agriculture. 9. Limited access to resources → In terms of technical information and financial means. How do Women Overcome Challenges? Women in agritourism also identified a suite of strategies they use to overcome their challenges. Figure 3 shows the strategies from most (biggest circle) to least (smallest circle) commonly used. Maintaining flexibility and controlling growth were not strategies women in their twenties and thirties used, most likely because they have less experience in business planning than older participants. Participants discussed the importance of learning from experience to overcome their challenges. Lessons were drawn either from their own or older generations’ experiences or by observing their peers. As farming and agritourism are often unpredictable, participants explained that maintaining flexibility in their personal and professional lives was important to overcoming challenges they face. As the participants had multiple responsibilities to meet, prioritizing tasks and planning ahead were key strategies that women used to keep the farm properly functioning while not becoming overwhelmed. Farmers stressed the need to strategize in carrying out agritourism and farming duties to find a clear path for their businesses. Having family and friends pitching in to get it done was a solution to the challenge of lacking reliable staff, especially during peak seasons. Women were very cognizant of controlling the growth of their operations to maintain the quality of their products and offerings and ensure the smooth operation of their farms, even if that meant limiting visiting hours. Finally, participants stressed their boldness in trying unusual solutions to overcome challenges. Figure 3. 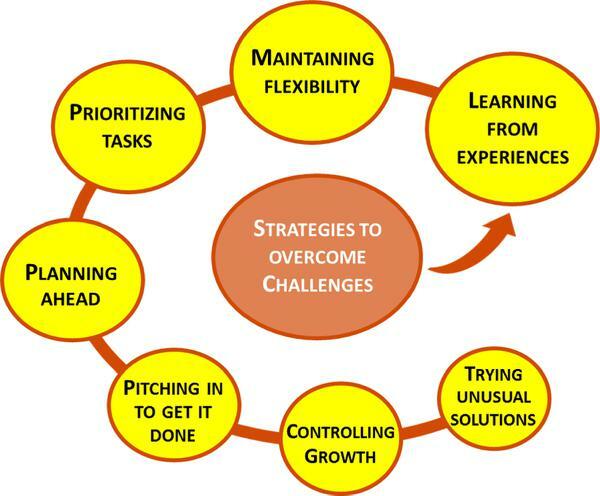 Strategies to overcome challenges. What Opportunities does Agritourism Bring? 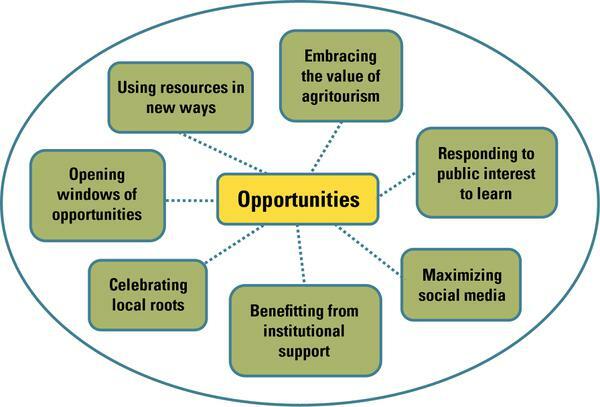 Study participants identified a number of opportunities that have arisen due to their roles as farmers and agritourism entrepreneurs (Figure 4). Women stressed that they were embracing the value of agritourism because of the manifold benefits their activities bring to themselves, their families, and their communities. These contributions ranged from being very tangible, such as revenue diversification, to very inspirational, such as influencing youth or showing women’s vital role on the farm. Being engaged in agritourism enabled women to foster a range of partnerships with peer farmers and other businesses as a way of opening windows of opportunities. Responding to the public interest to learn about food and farming and celebrating local roots, both related to customers’ desire to purchase local products, were perceived as important opportunities to portray women’s agritourism offerings as unique and authentic. Participants also discussed how agritourism provided a great opportunity for using resources in new ways, either by re-purposing old tools and equipment, or by extending the use of their property. Women stressed their gains in using social media for promotion because it is a free and effective media for targeting hard to reach markets given its ubiquity among consumers. Women also mentioned how they were benefitting from institutional support through key associations (e.g., North Carolina Agritourism Network Association), North Carolina Cooperative Extension, and the state government in general. Figure 4. Opportunities for women in agritourism. What do These Interviews Teach Us? Agencies should improve existing programs and introduce new initiatives to create a welcoming environment for women (such as seed grants for women in agritourism). It is also critical to improve the recognition of women as farmers and of agritourism as a form of farming. Women in agritourism should be proactive in communicating to the public, other farmers, and institutions about the many economic, social, and environmental benefits their operations bring to family farms and surrounding communities. Agritourism organizations should stimulate strategic mentorship programs so that women in agritourism can support each other like some farming groups do. Associations should also join forces with government and outreach agencies to strengthen their support system. Beyond stated strategies to overcome challenges, participants stressed the importance of capitalizing on a suite of available opportunities to harness women’s agritourism success in North Carolina. Among those, it’s critical to immerse agritourism into the local foods movement to capture the increasing number of customers who are willing to pay a premium price for high-quality products and genuine experiences from local providers. Voicing women’s understanding of success, challenges, coping strategies, and opportunities sets the foundation for agencies, farmers, and associations to work together for further advancing women-led agritourism operations in North Carolina. Barbieri, C., & Mshenga, P. M. 2008. The Role of the Firm and Owner Characteristics on the Performance of Agritourism Farms. Sociologia Ruralis 48(2): 166-183. Gil Arroyo, C., Barbieri, C., & Rich, S. R. 2013. Defining Agritourism: A Comparative Study of Stakeholders' Perceptions in Missouri and North Carolina. Tourism Management 37: 39-47. McGehee, N. G., & Kim, K. 2004. Motivation for Agri-Tourism Entrepreneurship. Journal of Travel Research 43(2): 161-170. USDA: NASS United States Department of Agriculture. 2014. 2012 Census of Agriculture. (Report No. AC-12-A-51). Our most sincere thanks to the study participants, who put aside their pressing commitments to share their insights with us. We also want to thank the reviewers of this publication: Dr. Whitney Knollenberg (Assistant Professor, NC State University), Leah Joyner, MS (Education Coordinator, Carolina Farm Stewardship Association), and Joanna Lelekacs (Extension Local Food Flagship Program Manager, NC State University). Our appreciation also goes to Dr. Zering, study collaborator, and the CNR-CALS Cross-College Enrichment Grants Program for funding the study.